Although Siesta Key Village property owners pushed back as expected on a Sarasota County proposal for them to pay about $100,000 to create new parking spaces out of right of way, Siesta Key Village Association (SKVA) Vice President Mark Smith is not giving up hope. That was the message he delivered during the SKVA’s regular meeting on March 1. “How do I put this,” he began during his Governmental Affairs report. Several ideas about increasing the Village’s parking capacity have “run into various obstacles, and one of them is … how to pay for it,” he said. He added that their feeling was, “Siesta Key contributes a great deal to the county coffers,” and the county has a $1 billion budget this fiscal year. “So I’m continuing to meet with the county to find a source of money,” Smith told the 14 people present. The proposal Smith worked on for more than a year would carve out about 300 more spaces, he told The Sarasota News Leader in January. However, much of the area that would be utilized belongs to private property owners, who would have to agree to open it up to the general public. 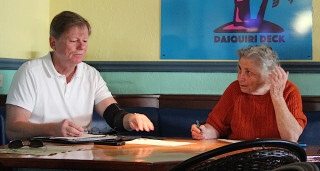 During the SKVA meeting this week, Peter van Roekens, chair of the board of Save Our Siesta Sand 2 (SOSS2), reported that the Florida Department of Environmental Protection (FDEP) staff member who has been heading up the work on the permit application for the Lido Beach Renourishment Project has left the state agency. Chiu Cheng’s last day was Feb. 29. “I don’t expect that will mean anything in terms of what [the department’s policies are at all,” he added. As of The Sarasota News Leader’s deadline this week, an FDEP spokeswoman had not provided requested information about the person who will be replacing Cheng. He recently spoke with someone, he noted, who had told him that not enough sand is removed during the dredges to keep the end of the channel open for any length of time. Perhaps New Pass could be a sand source for the renourishment of Lido Beach, he said. The U.S. Army Corps of Engineers (USACE) and the City of Sarasota applied in March 2015 for the necessary state permit to dredge Big Sarasota Pass to renourish Lido Key Beach. That application is still under review, with FDEP staff awaiting a response from the USACE on the state’s second Request for Additional Information. At the outset of the March 1 SKVA meeting, discussion ensued about the Craft Fair held Feb. 27-28, with some consensus, it seemed, that things went very well. 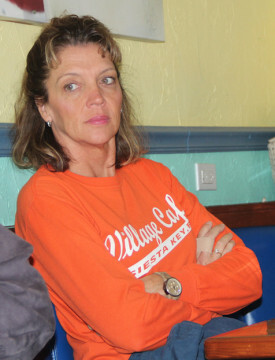 “I saw lots of bags [but] I don’t know what the vendors think,” said Kay Kouvatsos, co-owner of Village Café. Kouvatsos pointed out that a lot of people were in the Village. Then Glen Cappetta of Sun Ride Pedicabs remarked, “Ridership was down [for his employees],” adding that people were able to find enough parking spaces, especially at Siesta Public Beach. “A lot of people used that lot,” he added. Then they walked or biked to the Village. 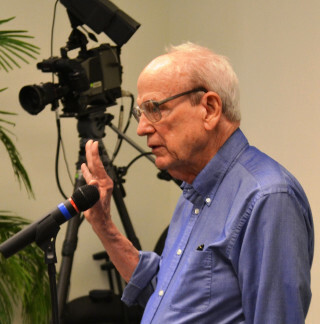 “Can I make a guess?” Siesta Key Association (SKA) President Michael Shay interjected. The SKA has fought for residents on Avenida de Mayo, who went through hearings before the county’s Traffic Advisory Council and then the County Commission to get signs posted to make it illegal to park on certain portions of their street. During an SKVA meeting earlier this year, Shay also warned that vendors no longer could legally park their trailers in the Municipal Lot in the Village. Kouvatsos told him she knew from Deputy Chris McGregor that deputies did ticket owners of trailers in the Municipal Lot. “I know they responded to Avenida de Mayo,” Kaspar added, but she was unsure whether tickets were written to people who parked on that street. “People aren’t going to come [to Village events] if [deputies are] over-zealous,” Kouvatsos pointed out. “No Parking” signs mean just that, Shay replied: no parking. “I’m talking side-street parking,” she told him. Kaspar told him that after she received the count of citations, they could talk about the matter. Then Mark Smith noted that a trailer was parked all day on Calle Minorga, with cones around it. “They moved it at night,” he said, adding that he presumed it belonged to a vendor. “You’re allowed to park in the right of way,” he continued, but he was not certain trailers could be left in a right of way. “It was a good size,” he added of the trailer. “Was it laminated?” Shay asked. “I don’t know,” Smith replied. The person never asked him about leaving the vehicle in the lot, Smith also indicated. Kouvatsos then asked whether the SKVA could move the Craft Fair back to the weekend before Valentine’s Day. Hyman responded that she thought the reason it was held late in February this year was because of a scheduling conflict on the part of the organizer, Howard Alan Events & American Craft Endeavors. 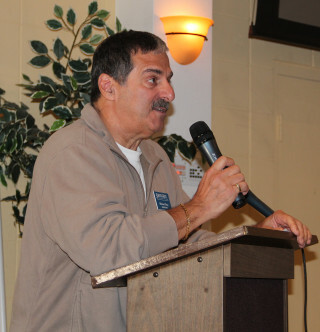 Hyman suggested Kouvatsos speak to Russell Matthes, an SKVA board member and co-owner of the Daiquiri Deck restaurants, who was absent from the March 1 meeting. Matthes is the organization’s liaison with Howard Alan. Secretary Helene Hyland said she thought one reason the event was moved to later in February was because of concern that the crowd would be smaller on Super Bowl Sunday. Kouvatsos responded that the game does not start until after 6 p.m., so she saw no conflict with the fair. Hyland disagreed, based on what she has heard. Still, she and Kouvatsos concurred on the fact that people could visit the Craft Fair and get home in plenty of time to catch the start of the game. This year, she said, additional deputies will be patrolling between 3 p.m. and 3 a.m., and officers of the Mounted Patrol will be present between 8 a.m. and 8 p.m.
Further, Kaspar continued, the department will have deputies out on ATVs. 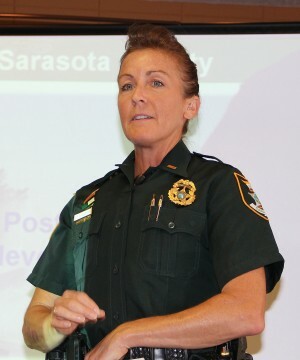 She noted that the department also has purchased a new six-seat vehicle for use primarily when parents are seeking lost children, children are trying to find their parents and deputies are transporting arrestees. Furthermore, public service aides will be working on the Key to check on problematic parking areas and issue citations, she pointed out. “Hopefully, that will be more [of a] preventive [measure] this year than in years past,” she said. In response to a News Leader request, county spokesman Jason Bartolone reported that about 225 people completed the walking tour county staff provided during the Grand Opening of the Siesta Beach Park renovations on Feb. 20. County Commission Chair Al Maio estimated the crowd size at 1,000, Bartolone noted. During the March 1 SKVA meeting, Ann Frescura, the new executive director of the Siesta Key Chamber of Commerce, reported that member businesses donated “such a wonderful variety of prizes” for the Chamber staff to give away at the booth it manned during the event. “At times, we had 40-plus people in line,” she added, with people eager to participate in a dice game to win prizes. “All went well,” she summed up the day’s activities for the Chamber. 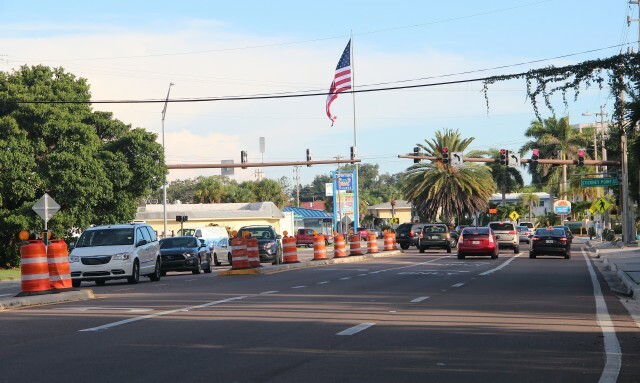 The Florida Department of Transportation announced (FDOT) this week that workers will begin functional testing of the Stickney Point Bridge repairs at 10 a.m. on Friday, March 11. Originally, the work was set for March 4, an FDOT news release noted. “The testing could last up to eight hours,” the release says.